I honestly do not know where to begin with this book, but just wow!!! This book made me so so angry, and let me tell you why. I was angry because I had never heard their story, it had never even been hinted at. This to me is such a heartbreaking, maddening injustice. What these women went through is unimaginable and their strength through it all is astounding. Let me back up a little and explain. 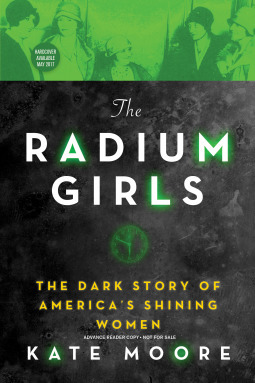 This is the story of the Radium Girls, Dial Painters from the early 20th century. They painted dials on watches, clocks, and various equipment so that it would glow in the dark. The part of the paint that was used and made them glow was Radium… Yes, you read that right, Radium!! These women had no protection whatsoever and many of them painted and were exposed to these dangerous elements for years!! And one of the problems is that it takes years in most cases for symptoms to begin. It was known fairly early on after the discovery of the element by the Curie’s that it was dangerous, but communication about it was so skewed and often portrayed as being beneficial. It took decades for these women’s voices to be heard and for them to even be diagnosed. Many years after that until it made it’s way through our court system and more years until it really had an impact on the industry. The amount of suffering these women had to endure, the strength they had to fight those who had harmed them, and their efforts to help those who came after them is just astounding! I cannot tell you how many times I cried while reading or became so infuriated that I had to pause for a minute. You will not believe that this book is really nonfiction and even worse that you have never heard anything about it. To me it is an unbearable travesty that this piece of history is overlooked. I think everyone needs to read this book and tell others about it. These women deserve to be heard! I gave this book five stars because of all I have written above, but also because it is a very well written book to boot. I could not put it down from the first page and finished it as quickly as I could. Kate Moore really draws you in and makes you feel like you are a party of the story. I believe that is one of the reason it is so devastating a read, you really get to know these women and you see their world. You can also feel the author’s obvious passion on sharing this story with the world. Excellently written book and an unbelievable story! I am forever changed from reading it and recommend it to everyone. It has been quite a long time since I have read a book that has ignited a passion in me. So much so that I have now added to my bucket list a trip to pay my respects to these amazing heroes at the one and only monument to them, which is in Ottawa, Nebraska. Thank you Kate Moore for opening my eyes and giving this story life.